The last, grand monograph by the explorer and ornithologist François Levaillant (1753-1824) contains a beautiful collection of promerops, birds of paradise, bee-eaters, (wood) hoopoes, scimitarbills, trogons, and turacos. Published by Denné le Jeune between 1807 and 1816/18, it is the third and final part of the series known as Histoire naturelle des Oiseaux de Paradis; des Toucans et des Barbus; suivie de celle des Promérops, Guêpiers et des Couroucous! Levaillant primarily commissioned Jacques Barraband (1786-1809) for the illustrations within the collection. Barraband’s bird watercolors are considered masterpieces of French ornithological illustration. He was held to be one of the greatest bird illustrators of his time, impressing even Napoleon Bonaparte, who became his patron. Later, when Barraband could not provide more drawings (most likely due to health problems), Auguste Pelletier (1800-1847) became the illustrator. As of now, little is known about Auguste. His works of art are of such phenomenal quality and detail that they easily can be interchanged by Barraband’s (ill. 2). Auguste created the watercolors when he was approximately eighteen years old. Like Barraband, he died before turning fifty, making him relatively unknown. This watercolor is a depiction of the Ivory-billed Aracari (Pteroglossus azara), a toucan species Auguste illustrated for this incredible monograph (1). The bird is featured in the last chapter of the monograph; a supplement devoted to newly discovered species that had not yet been illustrated. We are very pleased to offer a magnificent work of art by Auguste as part of our collection that contains many of the most beautiful watercolors, made for Levaillant’s bird books. There are three subspecies of the Ivory-billed Aracari, the one illustrated by Auguste being the azara (Viellot, 1819). Unlike the other two subspecies, its lower mandible is completely ivory colored, just like the watercolor. The bird is named after the Spanish military officer, naturalist, and engineer Félix de Azara (1746-1821), who observed described over 400 birds on his expeditions in the Río de la Plata region. The Ivory-billed Aracari is found in Bolivia, Brazil, Colombia, Ecuador, Peru, and Venezuela. It lives in subtropical or tropical moist lowland forests. Unlike other toucans, this species is very social. It forages alone, in pairs, or in small groups of up to five. They nest in tree holes, each laying 2–4 white eggs. The birds sleep with their young in the same tree hole, their large tails folded up over their backs. These birds have short wings and are primarily arboreal, distinctive characteristics for all toucans. The Aracari diet is mostly fruit-based, but they do eat insects and other small prey. As we look at this beautiful watercolor, Auguste portrayed the Aracari in an incredibly detailed way, unparalleled by contemporary ornithological artists. The meticulous hand-coloring displays delicate modulations of tone and color, fine lines, and perfect craftsmanship. Each feather has depth, texture, and translucence, providing remarkable detail and naturalistic color. The detail of the wings and underside of the tail is incredible; It is hard to imagine that these depictions were drawn by the hands of an artist, instead of actual feathers pasted to the paper. The copper plate print version of this watercolor pales in comparison, as it lacks the precise technique originally achieved by Auguste. The sleek, ivory colored bill gives a well-balanced contrast to the colorful plumage, which is rich in tone and variation of feathers. This can be seen by comparing the brightness of the plushy yellow under part to the complex green tones in the wings. Still, there are some differences between these works and living toucans. The issue Auguste and Levaillant had to contend with was the fact that the birds being studied were stuffed models. This explains why the bare, red skin around the eye in living birds is transformed here into a grayish hue. When birds are mounted, these parts cannot be preserved and the colors tend to fade away rather quickly. This portrayal of the Ivory-billed Aracari is life-size and based on a very fine specimen he saw in a Parisian museum. Description provided by Sandra van der Sommen, a specialist in bird prints and watercolors. Sandra received a BA with a specialty in prints and printing techniques from Leiden University. Her broad interest in nature – specifically ornithology - is the source of her curiosity in Natural History prints, drawings and books from the 15th till the mid-19th century. For her thesis she researched the monograph Histoire Naturelle des Oiseaux de Paradis (1801-1806) by François Levaillant (1753- 1824), with a focus on the bird-of-paradise engravings. These birds were illustrated by Jacques Barraband (1768-1809). Barraband is considered to be the best bird illustrator of his time. Sandra has worked with the extensive watercolor collection at Arader Galleries, providing in-depth descriptions of ornithological works. sandra.aradergalleries@gmail.com to arrange a viewing of this work, or visit Arader Galleries at 1016 Madison Avenue, New York, NY. 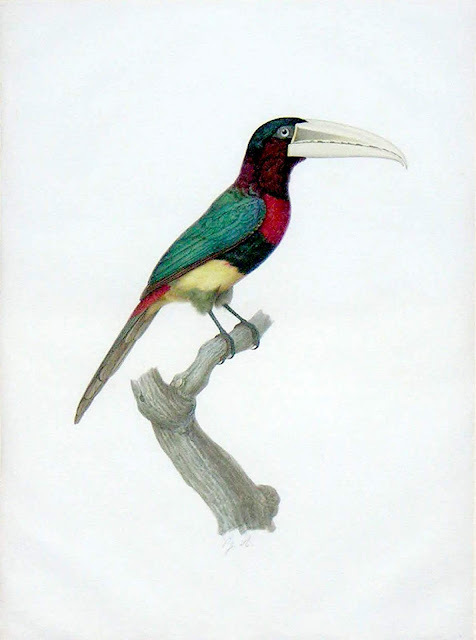 Auguste Pelletier (1800-1847), l’Aracari Azara, Watercolor and gouache on paper, ca. 1800, app. 20 1/2 x 15 in. Collection: Arader Galleries. Jacques Barraband (1767-1809), Aracari Koulik de la Guyane Male, Watercolor and gouache on paper, ca. 1800, app. 20 1/2 x 15 1/4 in. Collection: Arader Galleries. Nowadays, Promerops is used to indicate a family of African sugar birds, which includes two species. In the eighteenth and early nineteenth century, Promerops was a collective name for unrelated birds with long, slender beaks. The last part is titled: Histoire naturelle des Promérops et des Guêpiers (et des Couroucous, et des Touracos), faisant suite à celle des Oiseaux de Paradis. It is occasionally wrongly described in literature; the third part is then listed as if it consists of three volumes, which is incorrect. Levaillant, F. Histoire Naturelle des Oiseaux de Paradis et des Rolliers, suivie de celle des Toucans et des Barbus, Paris: Denné le jeune, 1806, vol 2, p.p. 27, 28. According to Hoyo, Josep del, and Nigel J. Collar. 2014. Illustrated checklist of the birds of the world. Non-passerines, Vol. 1, p.p. 624-627. Levaillant, F. Histoire naturelle des Promérops et des Guêpiers (et des Couroucous, et des Touracos), faisant suite à celle des Oiseaux de Paradis. Paris: Denné le jeune, 1807-1816/18, p.p. 40, 41.